The Maldives is an archipelago made up of more than 1000 islands, with a population of about 351,000 people. Most of the islands are uninhabited; 187 are home to people and 106 are designed as beach resorts for the well-heeled traveller. Grand corruption emerged as the biggest problem in the country when a massive scandal unravelled in 2015. 59 islands and lagoons have been subject to corrupt deals brokered by politicians. What is equally worrying, the judiciary is now so compromised by its closeness to the executive branch that many perpetrators of corruption may escape justice. 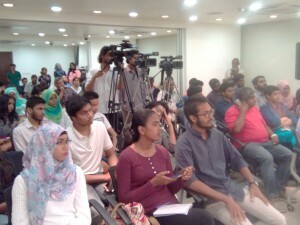 That’s why Transparency Maldives organised a panel discussion to look at the issue of grand corruption. It’s not just the watchdog institutions in the Maldives that have been apprehended. People everywhere who show any dissent face threats and intimidation. All the leaders of the opposition parties are now either in jail or in self-imposed exile. The charges? Usually inciting terrorism under a broad-brush law that has basically handed the government power to issue go-to-jail cards at will. This kind of arbitrariness is a powerful method to quash dissent. About a third of the Maldives gross domestic product comes from tourism. Selling islands for resort development is a source of significant revenue to the state. However, the tourism industry is an industry dominated by a few businessmen and politicians who work in collusion, with islands often used as bargaining chips. This corruption scandal came with forewarning. In 2014, the then Maldives Auditor General Niyaz Ibrahim raised a red flag when funds were being transferred to private accounts by Maldives Marketing and Public Relations Corporation (MMPRC), a government-owned tourism promotion company. His audit report revealed how millions of dollars had gone missing with a paper trail leading to private accounts linked with the then Vice President Ahmed Adeeb, who oversaw the company. Since then the Auditor General lost his job, but none of the money has been recovered. The former vice president Adeeb sits in prison charged with embezzlement of funds in addition to treason. The state audit reveals the amount to be $79 million, equivalent to the national revenue for the month of February. There are also links to several companies associated with politicians. Unofficial estimates suggest an amount of $230 million. This is grand corruption on a scale that will severely hurt the Maldives and further weaken the people’s belief in their leaders. With the judiciary deemed now little more than a branch of the executive and watchdog bodies deemed toothless, people have lost faith in the state’s ability or sincerity to get to the bottom of the scandal. The panel discussion on 14 March brought together lawmakers and the former attorney general to debate the issues. It concluded that the Maldives needs 10 key anti-corruption laws in order to tackle grand corruption, including a whistleblower protection law. Furthermore, it discussed how the parliament, judiciary, executive and oversight bodies have failed in their constitutional duty to protect public funds by deliberately neglecting the MMPRC corruption case when a red flag was raised in 2014. Transparency Maldives hosts these events to help Maldivians understand how their democracy and the ability to fight corruption are linked and how democracy is being eroded by the government. When there is no space for dissent, those in power will be able to abuse their power, both to siphon off funds from the state with impunity and to repress anyone who tries to hold them to account. The public needs to take an active role in pressuring lawmakers to repeal repressive laws which undermine civil and political liberties, and ensure that politicians regardless of their party affiliation, rank or social status are held accountable for corruption.